Your horse is unique and so is Kessock Equine Vets, being the Highlands only 100% equine veterinary practice. At Kessock, we aim to provide you and your horses, ponies and donkeys with the best possible care. Due to continued investment, we are able to carry out most procedures at your premises, as well as at the clinic. This can vary due to the facilities and assistance available! Please do ask and we are able to provide estimates of costs beforehand. We understand the need to remain as competitive as possible and so will continue to provide zone and yard options for you. This will involve some changes from the 1st of April 2019 for zone appointments and future bookings. We cannot specify the vet who will be attending or guarantee time preferences. A 2 hour time slot will be appointed. 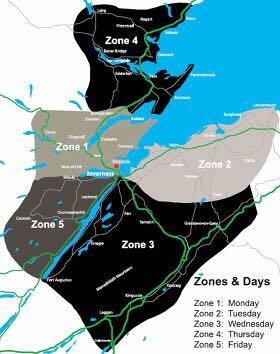 Introduction of £9 Zone visit fee for all other routine procedures. Contact the clinic if you have separate appointments for vaccinations and dental examinations already booked to combine them. It is difficult to give individual clients a specific appointment slot during the yard visit and so generally the appointment will be for the vets arrival on the yard. It may be possible for the vet to give a rough estimate of how long each examination or procedure may take. *Our usual visit fees and professional fees will apply. **£5 Discount no longer applies. ***Call the clinic for clarification if required. ****Clinic charges may be applicable.